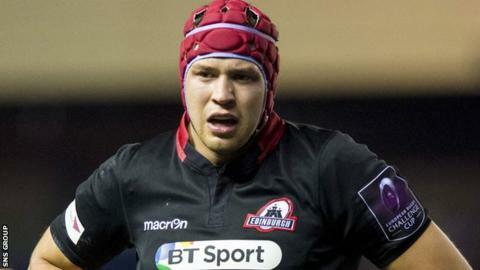 Scotland lock Grant Gilchrist has suffered another broken arm during his first game back for Edinburgh for 16 months following long-term injury. Gilchirst, 25, is to have surgery after he was hurt during Friday's 27-13 Pro12 defeat by Ospreys. It was his first club appearance since October 2014 when he fractured a different arm bone. He recovered in time for last year's World Cup but picked up a groin injury during Scotland's win over USA. Gilchrist, who had been named Scotland captain for the autumn Tests just days before his first broken arm, started the opening two games of the tournament in September. But his involvement in the World Cup was ended 19 minutes into his 12th match for his country. He came off the bench for Edinburgh after 55 minutes on Friday after two weeks of full contact training but is facing another lengthy period on the sidelines.